Having tallied the votes from both the English and Japanese Devrooms, Capcom officially revealed the returning Reaverbots for Mega Man Legends 3. Did yours make the cut? Coming in on top is Gorbesh, the shield wielding Reaverbot who loooves to dish one out and hide behind his trusty shield. Hot on his heels, Mimic, the fake/trap treasure chest, the tiny buy mighty Firushudot, and Poh, Legends 2's nightmare fuel. Based on strong user feedback, two additional Reaverbots were chosen: Arukoitan and Mandomantal. 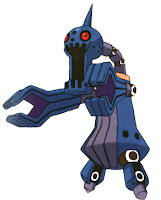 Arukoitan is the famed family of Reaverbots from Legends 1, sentries, of sorts that are controlled by their Ordakoitan brethren, and Mandomantal is a peaceful, water dwelling fellow who can be ridden to reach new heights. All great picks, in my opinion. Totally stoked about Poh's return... oh, the memories with that one; terrifying, to say the least! I'm positive I'm not alone on that one. Check out the full post at the devroom for complete details and commentary from the dev team.